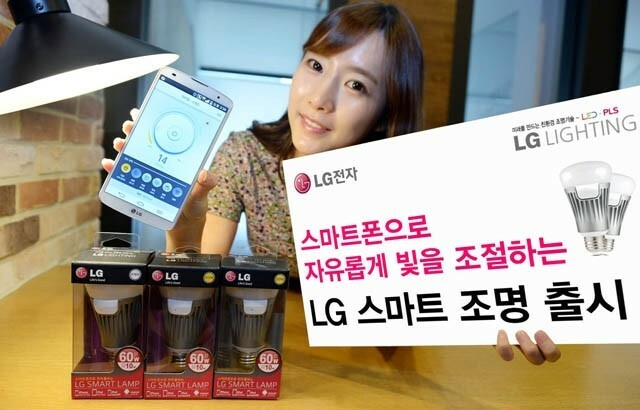 LG Electronics over the weekend unveiled a pair of LED-powered smart light bulbs. Smart Lighting, South Korean company’s first entry in the product category, will work with both Android and iOS devices and promise to reduce energy consumption by as much as 80 percent compared to traditional incandescent bulbs. The Smart Bulb includes a number of handy features and modes. Much like the morning sun, the bulbs can function like an alarm and slowly illuminate in the morning to wake you. There’s also a party mode that turns the light on and off in sync with music and a security mode capable of adjusting the bulbs while you are away from the home to deter would-be burglars. When paired with a handset, the Smart Bulb can be configured to blink when you receive a call. Similar functionality can be found on some smartphones (the LED flash blinks) under the accessibility options menu for the hearing impaired. For this and other wireless features, you’ll need to be running Android version 4.3 or iOS version 6.0 or newer. Each Smart Bulb is rated at just 10 watts (60 watt incandescent equivalent) and is available in blue or white hues. LED technology allows each bulb to last up to 10 years when used for five hours per day according to the company’s press release. A single bulb is priced at 35,000 won (around $32) although unfortunately, LG’s press release didn’t given any hints about when they would be available or in what regions.